Do you have work-from-home job openings? Did you know that last month there were at least 478,424 people who Googled words or phrases related to “work from home jobs”. Almost every candidate at some point in their life would love to work at home. If you link off to your work-at-home jobs from your home page then candidates and Google (which can send you A LOT of candidate traffic) know that you prioritize virtual jobs. Check out 5CA below. They mention “Work Remotely” front and center on their company career page. Check out Hilton. 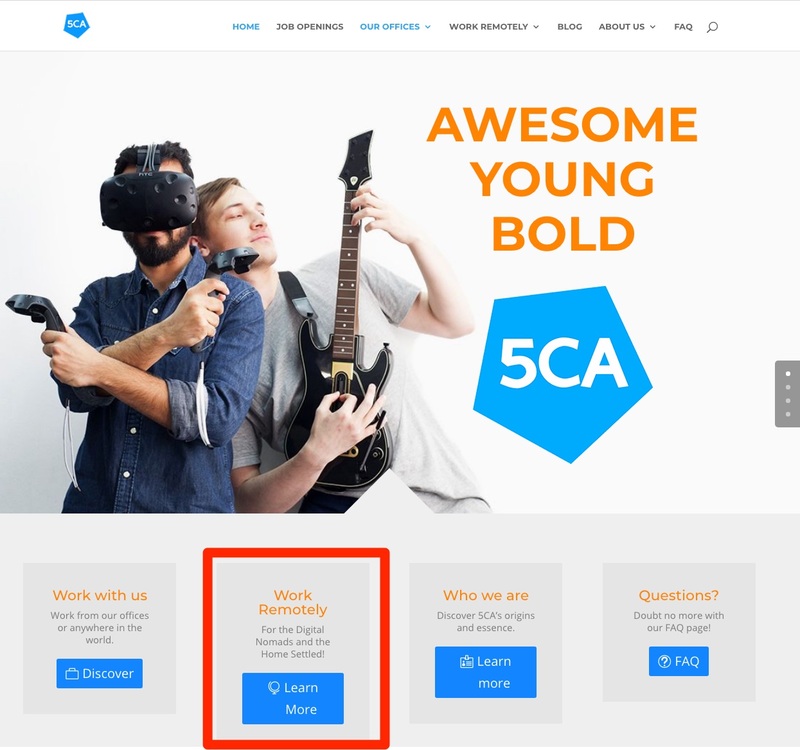 They invested in a Work from Home page on their company career site that looks better than many employers’ career site home pages. Amazon includes its work from home jobs (they call them “Virtual”) as a Category in their job search filters. Google will send you more traffic if you put the right words on your Web pages. For instance, if I was really into vegan hot dogs, and wanted to get some Google traffic to my web page about “vegan hot dogs”, I would write a single Web page about nothing but…you guessed it…”vegan hot dogs”. I wouldn’t mention “vegan hamburgers” on that page — I’d create another one for green-burger-loving fans. This works with “work from home jobs” too. 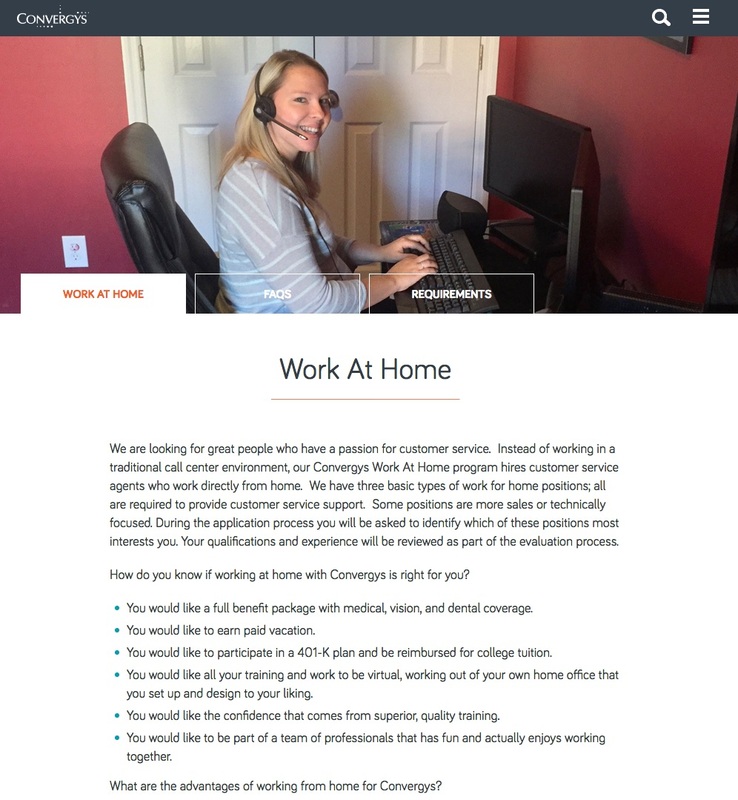 Check out the work from home page at Convergys. They mention the phrase “work at home” 39 times and the word “home” 85 times. You read that right: 39 and 85 times! One tip: they list 35 “work at home” job links and each has the phrase “work at home” (so they get an automatic head start over other employers who don’t do the same). Finally, an easy tip to drive more traffic to your Work from Home jobs is to make sure that you include the phrase “Work from Home” or “Work at Home” in your text and HTML. 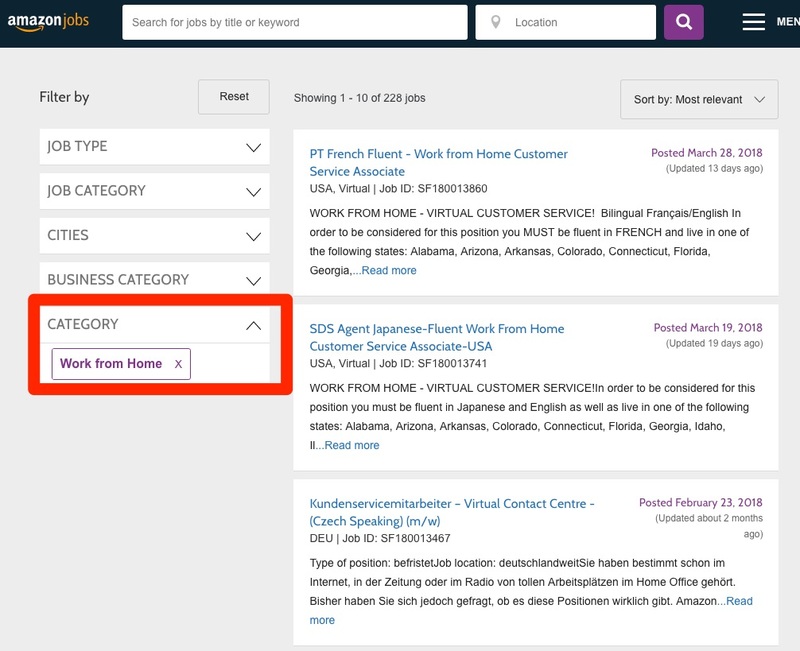 For instance, you should include “work from home” in the URL of any dedicated Work from Home microsite or any job page. 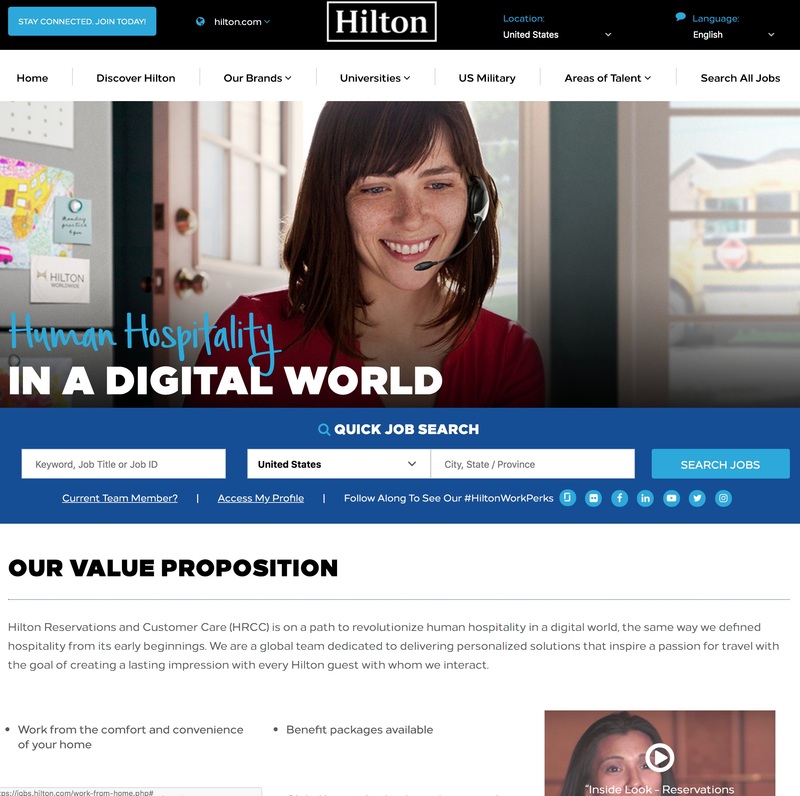 Hilton uses https://jobs.hilton.com/work-from-home.php as their URL. Google likes such plain english in the URL. It also pays to put a “Work from Home- type phrase in your title tag in your HTML. The candidate won’t look at your HTML…but Google will! With a half-million candidates Googling work from home jobs every month, you could build a nice flow of free candidates by applying these tips. I wrote this article because I care deeply about transforming your job descriptions. If you want help getting more work from home candidate traffic, just ask for an Ongig demo. Ongig’s software automatically creates SEO-friendly, high-traffic-type Work from Home job pages.